When we eat certain foods, we often chuck parts of them into the trash, like the core of an apple or the skin of kiwi. But it turns out that a lot of those food “scraps” which we routinely trash are actually edible and good for us. The next time you eat these foods, especially if you buy organic, make sure you don’t throw away the healthy parts you could be eating! Most of us just eat the florets of broccoli, but my favorite parts are actually the stalks. 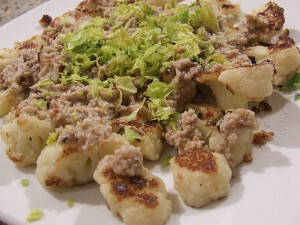 I grate them and add a bit of salt and vegan mayo for a super simple, healthy side dish. As for the leaves on broccoli, they are especially healthy because they contain carotenoids, which turn into vitamin A. Just throw the leaves in with the rest of the broccoli when you are cooking. 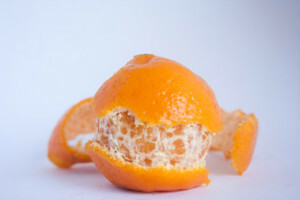 Most of us think of orange peels as the natural “packaging” surrounding the good stuff inside. But orange peels, as well as the white pith between the peel and fruit, are very healthy for you. 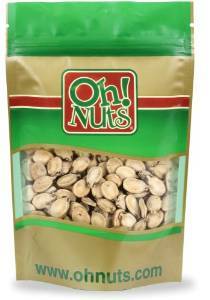 They contain flavonoid antioxidants, including hesperidin. Hesperidin is a very powerful anti-inflammatory and can also help lower cholesterol levels. The antioxidants in orange peels are also potent histamine-suppressors and can help with lung cleansing and allergies. Orange peel might be too bitter to eat raw, but that doesn’t mean you need to throw it away. I had a Russian guest stay with me once who made the most amazing hot drinks out of tea, orange rinds, jam, and whatever fruit I happened to have in the bowl that day. If you aren’t feeling experimental, you can just boil orange rind with some ginger and/or cinnamon and sweeten to your liking. 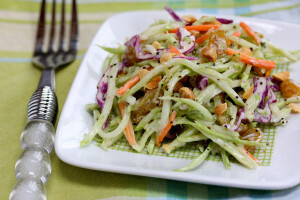 There are plenty of recipes which call for orange zest. And, at The Sprouting Seed, you’ll find 30 uses for orange peel including as a body scrub and mosquito repellent. Orange pith isn’t as bitter as the rind, so just leave it on when you are eating an orange. Celery leaves might not be crunch like the stalks, and you can’t slather them with peanut butter for a healthy snack, but you don’t want to throw them away. Celery leaves contain 5x more magnesium and calcium than the stalks, as well as vitamin C and antioxidants. Just like you would use celery – soups, stir fry, fresh juices, etc. 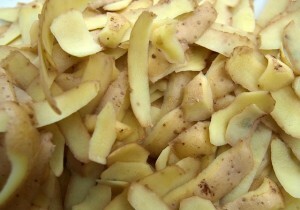 I never peel potatoes but, admittedly, it is mostly because I am lazy. In this case, my laziness has paid off with better nutrition. According to the Academy of Nutrition and Dietics, potato skins have more nutrition than the rest of the potato. Just the skin contains about half the potato’s fiber, and also contains calcium, B vitamins, vitamin C, iron, and other nutrients. As a kid, whenever we carved a pumpkin we would scoop out the insides and throw them out. The same went anytime we cooked a squash dish: all the seeds went right into the trash. This is ironic considering that squash seeds (aka pepitas) are rightfully considered a superfood. Squash seeds are rich in iron, Omega 3, zinc, magnesium, fiber, calcium, B vitamins, and a slew of other nutrients. They contain a lot of tryptophan, so can be good for helping you get to sleep and improving mood (tryptophan is converted into serotonin in the body). 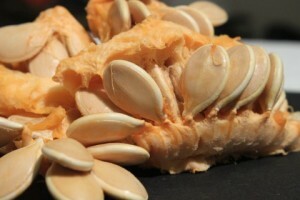 Pumpkin seeds are also anti-inflammatory and may reduce the risk of heart disease, cancer, and arthritis. Like with potatoes, laziness would prevent me from ever peeling an apple before eating it. 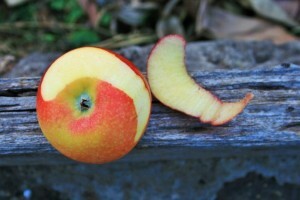 But, just in case I did feel inclined to peel it, knowing that the apple peel is loaded with nutrients would stop me. Apple peel contains more fiber than the rest of the apple (4.4grams of fiber in a medium unpeeled apple vs. just 2.1grams when the apple is peeled). Apple peels are also packed with vitamins A and C.
Another reason to eat whole apples is that they contain an antioxidant called quercetin which is mostly found in the peels. Quercetin is noted for improving lung function and breathing problems, and also may fight cancer and Alzheimer’s disease. If you are overweight, you’ll be happy to know that apple peel contains ursolic acid, which is found to increase muscle matter and “brown” fat, thus boosting metabolism. Eat the entire apple, peel and all! If you buy your root veggies from a farmer’s market, then chances are you get them with the green tops still attached. Don’t throw these away! Just like with other greens, the green tops of these veggies are loaded with nutrients like calcium, iron, zinc, magnesium, B vitamins, vitamin K, antioxidants, and more. 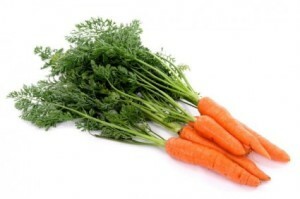 Oh, and if you’ve heard any rumors that carrot tops are poisonous, you can ignore this myth. Carrot tops are perfectly safe to eat! This one really surprised me because I’ve never considered eating watermelon ring. 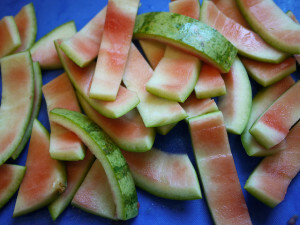 It turns out that the inner white part of watermelon rind contains citrulline. Citrulline is an amino acid which dilates blood vessels and thus improves blood circulation. Because citrulline is converted into L-arginine in the body, it is often toted as a performance-enhancing nutrient and said to fight impotence. The evidence to its effectiveness in these matters is scant, but there is no reason not to get an extra dose of nutrition and reduce your food waste by eating the rind. This one I found out about while I was eating watermelon and Skyping with a friend from Palestinian. He saw me spit out the watermelon seeds and immediately told me that I should eat them because they are good for me. Well, I did my research and it turns out he was very right (apparently, everyone in the Middle East eats the seeds). Watermelon seeds are rich in iron, magnesium, zinc, copper (which is why they are toted for improving your hair and skin), as well as other important nutrients. You can buy roasted watermelon seeds at some specialty stores, or buy roasted watermelon seeds on Amazon here . I have long prided myself on not throwing away any food. Well, it turns out that I actually have been tossing out a lot of perfectly usable food: banana peels. Yes, I know what you are thinking. You can eat banana peels? Well, it turns out that you can – and they are actually quite tasty. 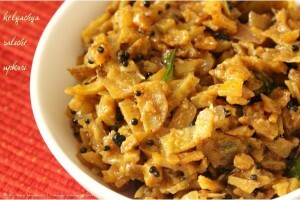 There are plenty of Indian recipes which use them as testimony to this. Banana peels are a great source of fiber and actually contain more than the flesh inside them. But the really cool thing about banana peels is that they contain lots of tryptophan, which means they can help you sleep. Tryptophan gets converted into serotonin in the body, and studies have found that eating 2 banana peels for 3 days can boost blood serotonin levels by 16%. Since serotonin is our “happy chemical,” no wonder other studies have found that banana peels can ease depression! If you aren’t keen on the idea of eating banana peels, you can also use them as a natural beauty remedy. Put them on your skin to moisturize it or to treat acne. Or rub on your teeth as a natural teeth whitener. Got a bug bite or poison ivy? Just rub some banana peel on it. The peels have powerful anti-inflammatory agents that will calm the swelling and itching. You can also rub banana peels on leather (or fake leather) or silver to polish it. Still have banana peels to use up? Put them in a jar and cover with water. Then use the water to water your plants. Do you use any of these food “scraps” in your daily meals? Have any other ideas for using scraps to reduce waste? We welcome your comments!